I love nothing more than escaping to the countryside for a quiet break. Fresh air, long walks, lazy lunches, hearty dinners and having to do absolutely nothing, but enjoy time passing slowly by. People’s ideas of the perfect weekend vary and no doubt vary considerably between sexes, but I think my lovely man and I agree on most of the above, except perhaps long walks. However, if he’s got his fishing rod in hand, I can make him walk for hours with the promise of a fishing hole at the end of the trail. 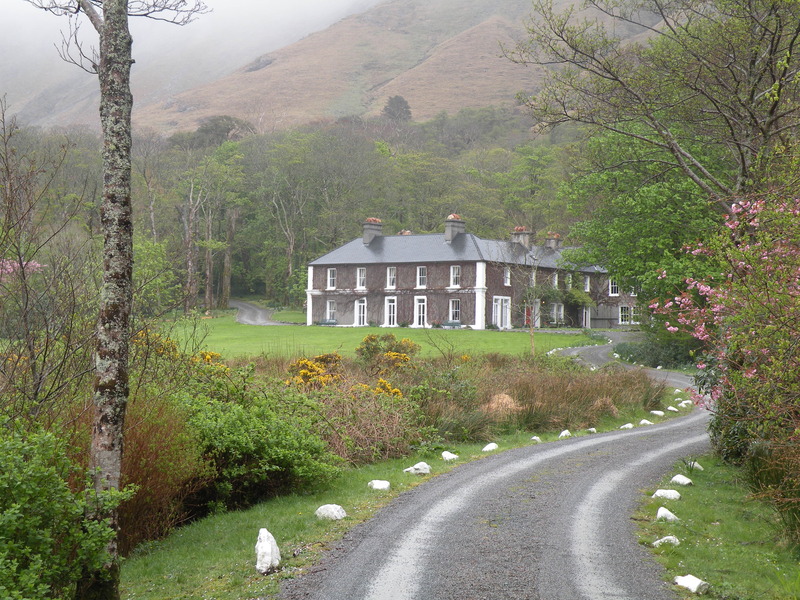 I have a soft spot for rambling country houses and Hidden Ireland happen to have plenty of these. 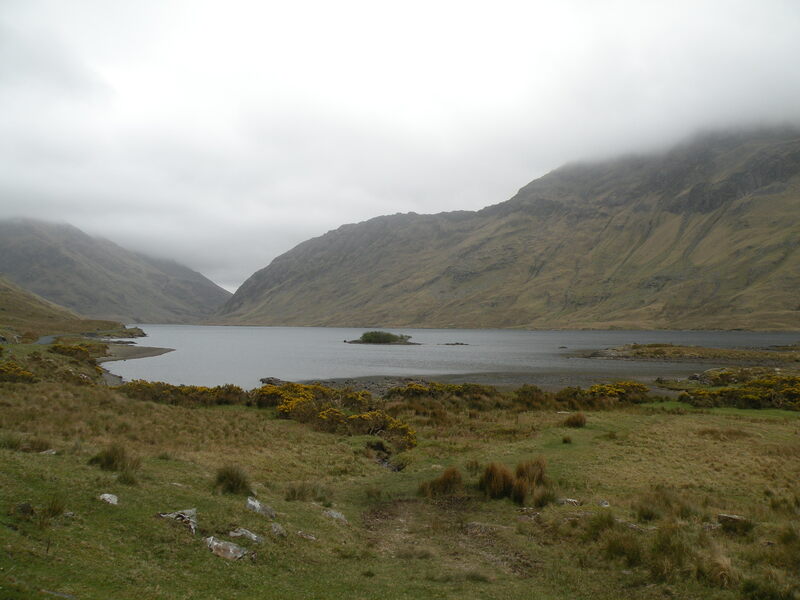 One day as I browsed their brochure, I stumbled upon one such house, Delphi Lodge. Overlooking the tranquil Fin Lough, Delphi Lodge is a popular getaway for fishermen, the surrounding lakes and rivers teeming with salmon and trout. I figured I couldn’t get a more perfect mix – fishing and a country house with open fires and a library, this could be our perfect His and Her’s weekend. We arrived on a damp April morning to the ivy clad, 19th century house, tucked into the scenic Delphi Valley. It was hive of activity for so early in the morning with men out front, pulling on waders and tying flies to their rods in preparation for a mornings’ fishing. I won’t deny I was like a fussing mother, as I eyed up their professional attire and looked back at himself pulling on a light jacket and pair of wellies. We had only just stepped out of the car before the manager, Michael, strode over to give us a warm welcome. Quickly clocking the fledgling nature of my lovely man’s fishing gear, he introduced David, who oversees the fishing on the estate. Within minutes he produced a pair of waders, a suitable rod and plenty of sound advice. Ten minutes later I was standing at the edge of the lake, watching their boat head into the mist, smiles on their faces. The joy of having a His and Her’s weekend is that you get to spend time together, doing things you both enjoy doing together, whilst also doing something for yourself. I doubt the boat had gone more than a hundred metres, before I jumped into the car and sped three minutes up the road to the Delphi Mountain Resort Spa. 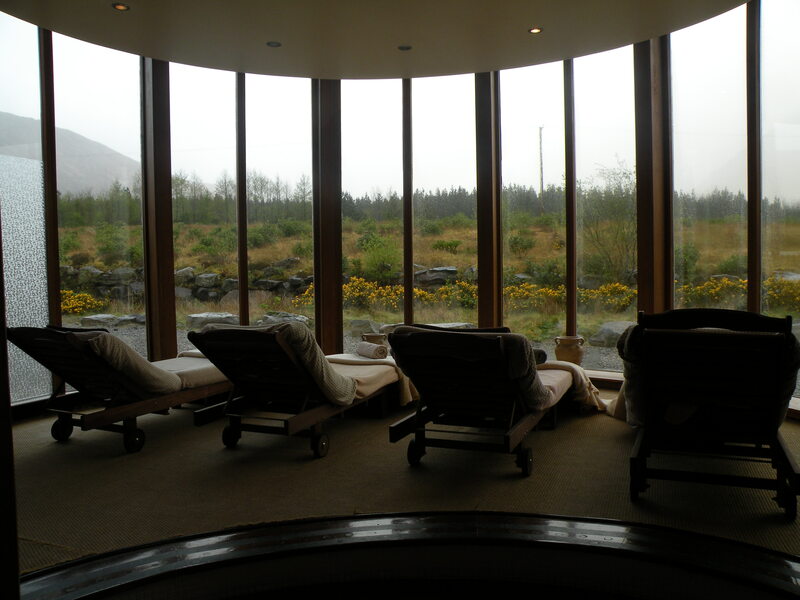 On a cold, wet day I can think of nothing nicer than pulling on a dressing gown, pottering into a spa, sipping healthy teas, munching on fresh fruit and lounging on comfy beds looking out onto the barren mountains of the west. 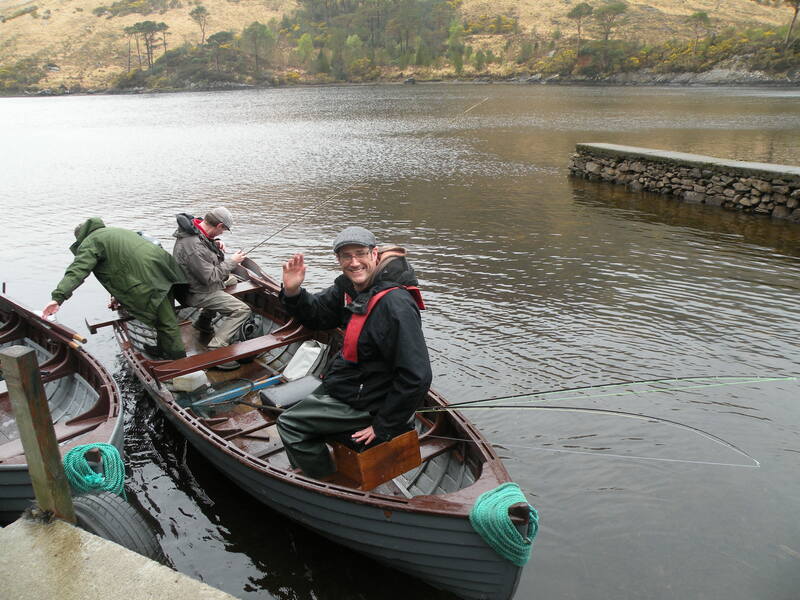 This is how I spent my morning as my other half braved the cold, choppy waters of Connemara in search of salmon. I smiled to myself as I soaked in a seaweed bath knowing he was happy, but wondered how, as the sheets of rain battered the windows of the spa. I returned to the lodge in time to find the men chowing down to a delicious lunch of sweetcorn soup, freshly made sandwiches and steaming pots of tea. It amazed and warmed me to see the camaraderie that had developed between them within a matter of hours and despite knowing little about fishing, I listened intently to their tales from the morning’s adventure. It seemed the rain had arrived in time, as an unseasonable drought meant the salmon were struggling to get up from the Fjord to the inland rivers and lakes and catching anything was unlikely. Despite the unlikely event of catching a fish, the troop set off again in search of the illusive salmon. Blissfully relaxed from my morning at the spa, I checked into our room, one of twelve in the house. Having recently undergone a refurbishment, all rooms retain a quaint country home feel, decorated with antique pieces and artwork, replete with modern bathrooms. Downstairs the library shelves are stacked with fishing books and some easy reads you can help yourself to, before curling up in front of the open fire and enjoying the peace that surrounds Delphi Lodge. Every now and then I got up from my post by the fire, looked out the window, sought out the boat on the lake and then happy in the knowledge they were still afloat, returned to my cosy perch. This is how time passes in Delphi Lodge, slowly, informally and delightfully. People do as they please during the day, whether it’s sneaking off to the lux spa, fishing, reading or walking. Evenings are a sociable occasion, with guests gathering in the spacious drawing room for drinks and canapes, swapping stories from their day. Dinner, a three-course meal, is served at the large mahogony table in the dining room. Scrumptious dishes like local lamb, quail and beef are cooked to your liking with overflowing side dishes of fresh veggies, all served by the warm and friendly staff of the house. The communal dinner creates a house party feel, like you’re staying in a friend’s home, part of a group who are all here for the same reason. To enjoy the peace and freedom of the countryside. While some get up to go fishing early, others enjoy a leisurely breakfast in the dining room. It’s a remote area with plenty of nearby beaches, forests and mountains to explore and they’ll pack a picnic to take on your explorations if you ask. We did little of this to be honest, we walked by the river, played trivial pursuit by the fire and loved every minute of it. That evening we chatted with the other guests, twenty-four hours having bonded us so we felt like old friends. Over a few drinks we all agreed the charm of Delphi Lodge was that it was a tranquil hideaway, with an old-world, homely feel and relaxed, friendly staff. A place where time meant nothing and strangers became friends. I have to admit being surrounded by fishing enthusiasts made me more inquisitive about the sport and if I’d stayed any longer (and if it had been drier) I would have tried my hand at catching a salmon. Yet, you don’t need to be a fisherman or woman to appreciate the beauty and charm of this place. It’s a place you come to unwind and relax and let go of the worries of every day life. Driving home we agreed that we felt like we’d been gone a full week, which I think is a very good sign. hello there and thank you for your info �C I have certainly picked up anything new from right here.